On a perfectly beautiful spring day, I drove up the Hudson to visit Toshi Seeger at her home in Beacon, N.Y. Toshi was on her bed resting up from an early visit from Judy Collins, who had dropped by to record some music with her husband, Pete. Toshi protested she couldn’t do an interview — couldn’t hear, didn’t remember, wasn’t interesting. When Judy was leaving, Toshi got up to go into the kitchen and say good-bye — good manners are important to her; we followed. (Judy, by the way, is stunningly beautiful!) Once in the kitchen, she stayed up and sat at the table. Pete went to see the visitors off, then disappeared leaving us to talk, with her daughter Tinya prompting, about her life. Toshi’s mother came from a family of well-to-do Virginians. Her father had emigrated from Japan; he worked for her mother’s family as a butler. The two fell in love, but could not marry in the U.S.; he would have been deported and she would have lost her citizenship. Pregnant, her mother fled to Munich, traveling with a girlfriend, and had her baby three months after she arrived there. Because she was born of a Japanese father, even though her mother was American, Toshi was not a citizen (the policy of a father’s citizenship determining the child’s only applied to Asians) and had to apply for American citizenship years later. Her mother returned to the U.S. when in 1922 it had become legal for them to marry, at least in the state of New York; Toshi was six months old. Her father had come to New York City earlier to look for a place to live, but was unsuccessful until someone suggested he go to the Henry Street Settlement House for help. Help they did: They found the fledgling family an apartment and gave her father enough money for a security deposit and one month’s rent in a building where he was able to work as a caretaker. As a young child, Toshi lived in Woodstock in a small, narrow house where her family grew vegetables and kept chickens. No one, Toshi said, ate the chickens, just their eggs, because they were pets (unless her Uncle Al visited and they cooked one for his dinner). Later they moved back to New York City. Her parents, being left-wing activists (her father was a Communist and her mother worked for the women’s movement) sent Toshi to The Little Red Schoolhouse then onto the High School of Music and Art where she played piano and was a member of the first graduating class. Toshi and Pete (they had been friends for years) married in 1943 because he was going overseas. ( “It was wartime, that’s what you did.”) They lived in different places, mostly either with her mother — for a while on MacDougal Alley, a tiny cul-de-sac just north of Washington Square Park. In fact, she lived with her parents always — with or without Pete — until, in 1949, the Seegers moved to Beacon, a factory town on the west bank of the Hudson River, and bought land. Their two older children, Danny and Mika, were born in the city; Tinya, the youngest, was born in Beacon. At first they lived in a tent with the two small children. They cut down trees to build a cabin. Toshi hauled water from the stream, chopped lumber and stood on the roof beams, once there were some, to pull up logs (even though she was afraid of heights). Toshi insisted she has no talent, that she doesn’t sing or dance, she only does housework. A friend at the table who worked with her for decades, and Tinya, her daughter, urged her to take credit for Clearwater, both the sloop and, perhaps more importantly, the Festival (officially known as the Great Hudson River Revival) which has been filling the air with folk music since the 60s. One talent: She was the key programmer for the Festival. Because she was friends with the people who organized the Folk Life Festival in D.C. and was close friends with George and Joyce Wein, organizers of the Newport Folk Festival where she was a member of the board, Toshi often knew about performers long before they were on most people’s radar, even before most of the members of the Festival planning committee had heard of, say, Tracy Chapman. Clearwater may have paid poorly, but performers came because of Toshi; she was the one who pulled it all together. Another talent: She was the navigator for the Clearwater voyages. Toshi had learned to sail with her family, way before Pete took it up; she taught him how to sail. Pete joined us and warmly underscored this role: “She was the one who steered the boat; she had the chart; she kept us off the rocks.” Without the Clearwater voyages, which called attention to the contaminants that were killing the Hudson, the river might still be poisoned with PCBs. 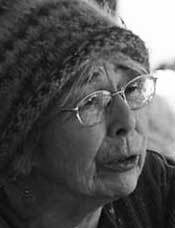 Toshi also shot films, folklore research films. At one point she went to Huntsville, Texas, where she produced a film of the prisoners chopping trees and singing their songs. The film, “Afro-American Work Songs in a Texas Prison,”can be found online in the Library of Congress archives. When Pete’s career became all-consuming, her projects were “bookshelved”. While Tinya made lunch, Pete, ever the great raconteur, talked about the history of Beacon, from the time when, still a working-class town, a dye factory would spill its run-off into the river — pink one day, green another — until the DIA Art Foundation came up from New York City, about 10 years ago, and artists began to move in. As Pete supplied detail after detail, Toshi said softly, “Did you notice Sue stopped writing?” She twinkled. View More: Next piece "Marilyn Hacker: Poetry of Anger and Love", Home, Archive. I knew Toshi through Pete for about twenty-two years and marveled at her organizing skills, including organizing Pete, but what struck me as her strongest suit was fantastic sense of humor, which you wouldn’t see unless you tried trading something humorous with her. Then she would relate to you as someone who appreciated,”laughin’ just to keep from cryin.” She’s already sorely missed as the spiritual guide of the Revival; we’ll all miss her, and her generous, heart deep smile. I only met Toshi once, when I performed a concert with Pete in Chicago, but she mad me feel like I had known her for years. The full story is on my web site. I’m an Indian and here Pete Seeger is a loved name. Feeling sad not to have known Toshi Seeger all these days. But that she has left us all yesterday made me read about her …hats off to you dear Toshi, love u lots ! Behind every great man is a greater woman. Pete was free to be Pete because of Toshi. Thank you for the interview. I briefly met Toshi for the first time at the party after Pete and Peggy’s Schenectady concert, 12 May, having travelled from England for the event. I’d met Pete many years before when I was with Peggy and Ewan MacColl’s Critics Group, as a folksinger/writer. Although in a wheelchair her face was warm, lovely and alert as all her photos seem to say. Pete had sung all her wonderful “family” verses to “Turn Turn Turn” at the concert. I was amazed to read that Toshi attended the High School of Music and Art. I too went there, class of ’59! That and Pete shaped (blessed really) the rest of my life. There’s a song “Troubadour” for Pete’s 94th birthday on Youtube, http://youtu.be/P_RBt_WGuRY. Have a listen and thanks for the story. Thank you for this Sue. Toshi is quite a treasure and I was happy to find this story about your visit. Wonderful! How wonderful to discover this article about Toshi-Aline Seeger, and to learn of her great input on so many things.